Hello Friends, its Saturday and we have made it to the weekend. I hope you are getting some crafting time in this weekend, I know I will. 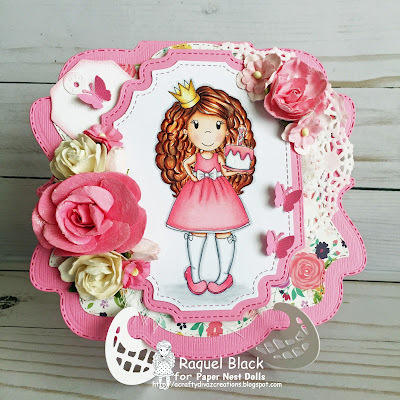 I am sharing a card over on the Papernest blog showcasing Birthday Princess Ellie. She is super adorable and was excited to see her released this month. I decided to make a shaped card and I cut my card base out using one of my dies from my stash. I used the princess collection DSP from Echo Park which I love. I colored the image using my copics and cut her out using a shaped die from my stash. I added some wild orchid craft flowers to the card along with some butterflies. I added some shimmer to the flowers and the birthday cake. I love this card, it is super girly for sure. Check out the Papernest dolls store if you are interested in this cutie. Don't forget to share your creations over on the Papernest Dolls Facebook page. That's all I have for you, thanks for stopping by. Have an awesome weekend!